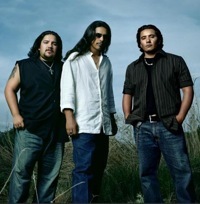 "We grew up listening to rock, the blues and country, and doing songs in both Spanish and English"
Now Los Lonely Boys, who’ll appear tonight at the Wildhorse Saloon along with Dave Barnes, has emerged among the top bands in the rock/pop world. Their third studio release Forgiven was released in July and produced by Steve Jordan. Los Lonely Boys spent a lot of time in Nashville during the ‘90s, and while they never quite hit it big here, they have some fond memories of their stint in Music City. Subscribing to Hispanic Nashville? Read this.